phis seven days in Israel. or have served our community. Gulf Coast Realty Investors, Inc.
3,000 Jewish community leaden from throughout North America are expected to attend. Ladino to highlight the unity and diversity of the Jewish people. 100th anniversary of the birth of David Ben Gurion, featuring his grandson. Nov. 13 and 14 for student matinees, and an evening show Nov.
ty Center. For more information, please call 228-7341.
on-the-air hosts. Get up and tune in, or at least set your VCR's. wish her well in her new endeavors. Kopelman, son of Jack and Betty Kopehnaa. Way to go, guys. School. Later that day, there was lunch and a Scavenger Hunt. Among the finds were many new members! Brodsky, programming; Jodi Goldsmith, projects; Joel Verllin. secretary. They have a great year planned. born September 30 to Rabbi H. David and Natalie Merknr Rose. Jacob Grossman is in Toronto. Beach, and Vera Isaacs and the late David Isaacs, Miami. year tour of duty in the Army. Surgery of the American Academy of Osteophathic Surgeons. The Jewish Floridian, 2808 Horatio St., Tampa, FL 33609. TOP for the next two years. 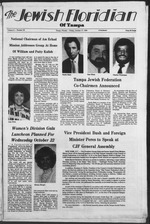 Feinberg of Orlando as Treasurer. "De Beers Diamond Days and Nights Collection"
fund is called a "Designated"
this fund can be made at any time. munities of Warsaw and Cracow. based on your charitable interests. Endowment Board by Douglas B.
sportswear which will be available for purchase. come with growth and expansion. Featuring the finest In Kosher Meats. served by the first week of November, 1986.
for the year to come. minds; all cry out for a response. Thursday, Oct. 30 8 p.m.
ly on the following morning. all the activities of the individual. Torah nor practice good deeds. dancing with the Torah scrolls. breast of even the simplest Jew. Its Post* Natural Bran Flakes. "tfyou will it- It's No Dream." our North Branch as part of his Eagle Scout training. $150 yearly renewal based on 50 membership units. and under, $5. Senior adults and students, $8. Zedek, or at the Hillel School. North Branch. To set up you? terest and work on projects. Nov. 13 at the Main Branch. all 10th through 12th graders. Nov. 4, 7 p.m., Main Branch. Room Lunch on your own. 11:30. Presentation at 1 p.m.
for non-member till Nov. 28.
won by Sarah Pear, and Bar-B-Que. cepting application for parttime teachers and aides. If you have not received your 1986-87 program guide. and we wifl mail one to you. Women are doing just that. "It's a window into the future,"
Gall, Sandy Harwood and Marcia Strong. the feelings of our elderly." tapes available to the community. (Simchat Torah is Sunday, Oct.
joyous holiday in Jewish tradition. draw two Torahs for ark. an apple on top of stick. 12410 N. DALE MABRY HWY. World Zionist Organization Treasury In The U.S.
the arly age of 14.
five years later by his family. in the 1948 War of Independence. aughter, Deborah Lynn, to Dr.
Mrs. Sorrel L. Wolfson of St.
Mark is the grandson of Mrs.
Mildren Wolfson Johns of St.
and the late Mr. and Mrs. L.
of Medicine in Tel Aviv, Israel. biology at Tel Aviv University. charge of the bank's manpower. thousands of Schlichim to Israel,"
OF YOUR LIFE. FOR WEDDINGS, BAR MITZVAHS. MEETINGS. We're not toolad for a mlnuta. reputation on It. and w*"ra trt. cient air conditioner realty doesnl coat you a cent! day evening Oct. 17 at 7:30 p.m.
vices will commence at 9:30 a.m.
ing your Lulav and Etrog. of course Hakafot with the Torah. and join us for this great occasion. join us for this festive evening. and directions. B YOB if desired. munity service, and fund raisers. kah, at a site to be announced. gregation Schaarai Zedek on Nov.
for the many special guests. for all would-be cowgirls and boys. shared by groups of any size. El's 14th Annual Art Festival. NOW OPEN THURSDAY TILL fcOO P.M.
Saturday, 9 s.m. Daily moraine and evening minyan, 7:80 a.m., 6:46 p.m.
Friday, 8 p.m.; Saturday, 9:80 a.m.
Haoban Service. : Friday, 8 p.m.; Saturday, 10 a.m. Daily: Minyan, 7:16. Farter Services: Friday, 8 p.m.; Saturday, 9:80 s.m. 7 p.m.; Saturday morning 9:80 a.m.
munity Lodge, 402 W. Watan Ave. (at Ola). P.O. Box 271167. Rabbi Yoeaie Dubrowaki, Executive Director. 968-2817. 18801 N. 87th St No. 1114. Rabbi Dovid Moddn, Program Coordinator. 971-6284. Friday night Services one half hoar after sunset. Tuesday night claaaea at 8 p.m.
B'N Al BRITS HILLEL FOUNDATION as U.8.F./U.T./H.C.C. study discusson aiaajnaii, "Shabbat Experience," monthly services and dinner. tion of headquarters of publishers: 120 N.E. s. Fred K. Shoehet. publisher. Cmmmoam, Jj**^^^ j^, .J44e> pen* Qa* **** Tamp. Orange, N.J.; and three grandchildren. since 1968, moving from North Carolina. area eight years ago from Rochester, N.Y.
Raleigh, N.C.; and three grandchildren. typing, filing, general office work. Call 875-1618 to arrange for appointment. The need lor advanced security systems has never Oeen greater. Does not include gas, mileage or insurance.